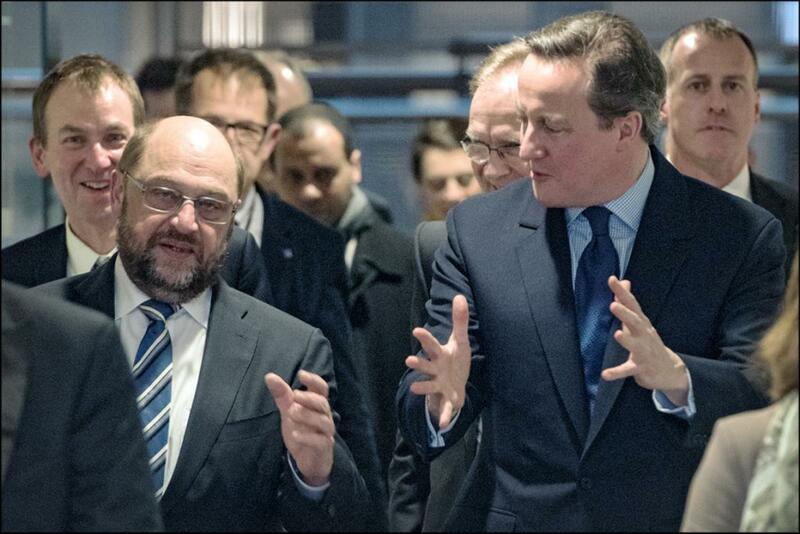 Welcoming UK Prime Minister David Cameron to Brussels today 29 January, President Martin Schulz noted that, as co-legislator, the European Parliament will have a key role to play in the success of any initiatives for EU reforms resulting from negotiations. Their meeting revolved around UK demands for changes to its relationship with Europe ahead of a referendum on the country's membership of the EU. The British vote will also be on the agenda of the upcoming EU summit on 18-19 February. Following the meeting with Prime Minister Cameron, EP President Martin Schulz highlighted Parliament’s commitment to a positive result from the EU-UK negotiations: “We are deeply convinced that both the UK and the EU are stronger together than apart." In or out? Britain will decide on its future in Europe with a referendum once negotiations with the EU have been concluded. A delegation from the Parliament's constitutional affairs committee went to London on 16 and 17 November to discuss the upcoming EU membership referendum with ministers, parliamentary committees and think-tanks. We spoke to committee chair Danuta Hübner, a Polish member of the EPP group, about her findings and the upcoming negotiations.